Much like My Lady Jane, this book is a comic retelling with paranormal elements; where My Lady Jane was a historical retelling, this one is the retelling of Jane Eyre, and adds a fourth wall element to it. 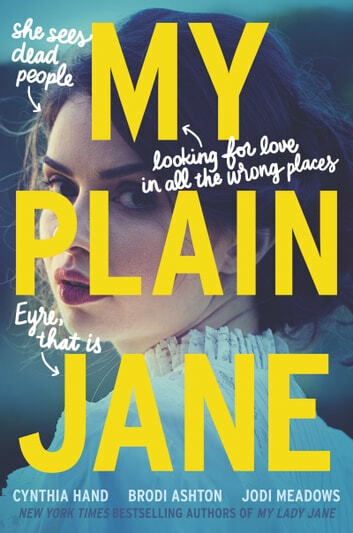 You don’t need to have read either My Lady Jane or Jane Eyre to follow this one, but having an idea of the barebones plot of the latter is a good thing while going into this one, if only to catch the inside jokes. Much like My Lady Jane, this one is told by the Lady Janies aka the three authors of this series, and they tell it much like as if you were sitting and having tea with them. It is a fun-filled retelling, lots of anachronistic jokes, and some deliberate bending of history. 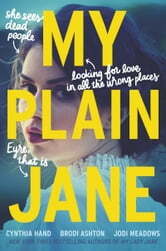 In My Plain Jane, we have three POVs – Jane Eyre, Charlotte Bronte, and Alexander Blackwood (who is a ghostbuster-esque agent). If you are wondering how the author met her character, in this story, the Jane is a teacher-friend of hers from whom the young teen Charlotte derives inspiration from. Much like the original, Jane falls for Rochester and all, but there are several marked differences: there are ghosts in this book, which have their own canon in this universe. The addition of ghosts allows for the plot to have an extended story, with Helen (Jane’s childhood friend) still hanging around in ghost form to deliver snarky commentary, a royal coup being planned with the aid of ghosts, and an interesting twist in the Rochester family history. The addition of Alexander as a ghostbuster (I will call him that because this joke is made in the novel) is hilarious, because at first it seems like he will be a love interest for Jane, but then he isn’t. Charlotte is a young rebel, who wants to be a writer but just can’t decide what exactly she wants to write. Both of them also have a funny habit of carrying around a notebook in which they constantly write things. The character of Jane is much like the Jane of the original, only she actually gets a backbone after that betrayal. She is also able to see ghosts, much like Alexander, and Helen is her secret companion. She initially hates on Alexander because she thinks he is tormenting the ghosts, and he keeps attempting to recruit her for his organization, which is where the main plot of the story comes into play. Meanwhile, Charlotte and her younger brother Branwell are his assistants, who are helping him with his mission, and later on they all thwart a power grab by a Duke. The story is a bundle of laughs, that goes without saying. There are constant jokes, snarky comments and little wink-wink inside jokes thrown in, so it is entertaining throughout. I found myself laughing quite frequently throughout the book, and also going ‘awwww’ at the romance (not the one you are thinking). The authors also change things around, like introducing burlap sacks and stuff, and a lot of contemporary references – there are jokes calling out The Princess Bride, Jane Austen novels, Harry Potter, the current US administration, and also frequent jokes about propriety and fashion in that era. There is also a sneak appearance of the characters from My Lady Jane. Basically, it is a delight to catch all these references too. However, there was one aspect in which this did not match up to My Lady Jane. That book had an airtight plot, but this one, in the retelling forgoes explaining much of the original story. You see, with the twist delivered in this book, it doesn’t match what happens in the first half of it. The time when Rochester’s was being threatened by his wife, and who even stabbed her brother? – yeah, that does not fit with what is revealed later on. There is no motivation given as to why she would do such a thing, or even if it was someone else instead who did it. So, while the book overall is very entertaining, I felt like that plot-hole kind of made it fail as a retelling. In short, this is an entertaining book, for those who love comedy mixed in with dashing adventures, and a sprinkle of pop culture references. It just needed to connect as a retelling to the original story. I share the same goofy humour as that of the Lady Janies, so I completely loved this! It is irreverent to the famous Jane Eyre, and really, it’s about time! Because corsets. Because pre-Victorians. Because sometimes you just want to mock famous people even if they weren’t real or are from another century.